In making touches to the chest and the left cheek of the opponent, the blade is extended slightly beyond the target, and, in executing the cut, the blade is pulled back across the target. In making cuts to the top of the head, to the right cheek, to the flank or to the arm, the blade makes a short forward cut on the target, executed with a snap of the wrist. This snap, however, must not take the blade more than an inch or two away from the target. Both in cutting and thrusting, the arm is completely extended at the finish, unless the the distance should happen to be so close that the opponent can be reached without a full extension of the arm. From an engagement in the Third Guard the hand is turned presented to head and simultaneously the arm is extended completely. The lunge is begun immediately after the extension has been started. Immediately after the blade makes contact with the head, the right foot lands in the lunge. The actual cut is made on the top of the mask with a forward snap of the wrist. This snap, however, must not take the blade more than an inch or two away from the target. Nor should it remain pressed against the mask. In making the cut to the head, there must always be an angle between the saber and the forearm, hand at right shoulder height, in order to protect the forearm with the guard of the weapon. From an engagement in the Third Guard, the hand is turned presented to flank. The arm is extended and the blade is moved forward, clearing the opponent's guard as close as possible to his forearm. The lunge is begun immediately after the extension has been started. Immediately after the blade makes contact with the flank, the right foot lands in the lunge. The cut to the flank is made an instant before the right foot reaches the floor in the lunge and is made with a forward slicing motion. Return to Third Guard. From an engagement in the Fourth Guard the hand is presented to chest and the arm is extended completely. The lunge is begun immediately after the extension has been started. Immediately after the blade makes contact with the chest, the right foot lands in the lunge. Draw the blade back across the chest to the left in a diagonally downward movement. The touch always is made as a light tap and the blade is drawn across the chest in a backward slicing motion. The slice is started before the right foot begins the recovery to the Third Guard. A cut to the RIGHT CHEEK is made in the manner of a cut to the flank, except that the saber is held higher (the hand at cheek height) and the blade is kept in a horizontal position. A cut to the LEFT CHEEK is executed in the same manner as a cut to the chest, i.e., in a downward diagonal direction, but with the hand held higher (at cheek height). These cuts, when made on the under part of the arm or the outside of the arm, are made in the manner of flank cuts; a cut to the arm as a head cut; and on the inside of the arm, either in the same direction as a chest cut, or, they may be made with the blade and arm forming about 150 degree ? and with the use of the wrist and slight use of the forearm. A successful attack in saber fencing consists of a cut or thrust landing on the target in such a manner as, in an actual duel, with either edge of the blade, would draw blood; or, as a thrust, it would cause a punctured wound. Touches made with the flat side of the blade, according to the rules, are not valid, although it is very difficult in some cases to distinguish between a touch made with the edge, half flat or flat. A SIMPLE attack consists of one movement; whereas COMPOUND attacks are made in two or more movements. In addition to the above examples, it will be necessary to practice simple attacks from all possible positions. These simple attacks should be made to all parts of the defender's target except, of course, to the one which is closed by this Guard Position. DIRECT CUT---The direct cut is a forward movement in the same line, with or without a lunge according to the distance, and finishes as a cutting movement with the edge of the blade. DIRECT THRUST---In saber the thrust is always made with the hand in pronation. CUTOVER CUT or CUTOVER THRUST---The cutover is a simple attack made in the opposite side of, and above, the opponent's blade. It is not made with the forearm alone, but also with the assistance of the wrist, which, as in all actions, is locked in the moment of completion. DISENGAGE THRUST--the disengage thrust is made in the same way as the foil thrust, except that the hand is always in pronation. DISENGAGE CUT--Is made on the opposite side of the opponent's blade by moving the attacking blade either above the point of the opponent's blade or under the hand. In saber fencing, both cuts and thrusts can be used as feints by merely presenting into the line you wish your opponent to close. Compound attacks consist of two or more movements, and the touch may be made as a cut or or thrust. Replacements, Redoubles and Renewals of Attacks may all be made as cuts or thrusts. Counter attacks may be made as: TIME cuts or TIME thrusts; and as STOP cuts or STOP thrusts. It is most essential after each time cut, however, whether it lands or not, that a parry be taken immediately, covering the threatened target so that even if the time cut failed, a parry and riposte may save the situation. It is advisable to make a leap backward with a parrying motion after the time cut has been made (by placing the right foot close behind the left one, bringing the left foot back and finishing the backward leap in the normal "On Guard" position). The Guard Positions described previously are identically the same as the final positions of the Parries. It is understood, of course, that the guards are still positions whereas the parries are actions, the defender moving his blade from one position to another. The CEDING PARRY may be used against straight thrusts made with glides by letting the blade be carried to a parrying position by the force of the attacking blade, instead of resisting the attack in the original position. For instance, when a thrust is made with a glide in second, the saber is led to the Fourth Parry; or, when a thrust is made with a glide in Third, the saber is led to the First Parry. The FLYING PARRY may be used as "Parry of First and Riposte to the Head," in one continuous movement without halting even for an instant in the parry. The COUNTER PARRY is made with the wrist and a slight use of the forearm, the point of the saber describing a complete circle around the opponent's blade. The wrist must lock just before meeting the opponent's blade. The wrist must lock just before meeting the opponent's blade. This counter or circular parry is used against thrusts only. The RIPOSTE (Return) may be made as a cut or thrust, executed after a parry, with or without a lunge, in reply to an attack. 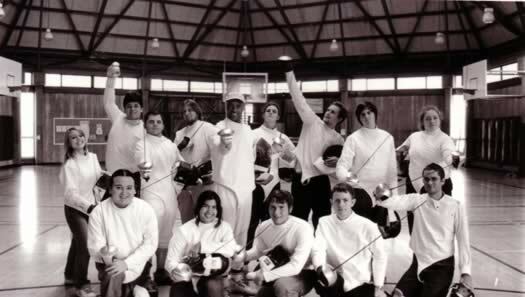 When two fencers are of equal experience, it will be almost impossible for either to score an attack, unless the opponent is completely surprised by the action, i.e., unless the attack is made "in time." On the other hand, when an attack is made in time, in the correct distance and with maximum speed, the probability of bringing this attack to a successful finish is 99%. A fencer is always alert in a bout. However, it is impossible to maintain the same degree of alertness throughout the bout, it rises and declines. Therefore, it is obvious that when an attack is made at the peak of alertness, the adversary will be most ready to parry or make a counter attack. Once his alertness begins to decline, the attack will have a good chance. Thus, theoretically, it is easy to understand when to attack. In practice, however, this is the most difficult problem of a fencer. We may speak of two kinds of timing: Conscious, and Subconscious timing. Standing up or sinking in the On Guard Position. Making on advance. Making a retreat. Recovering from a lunge. Making a feint without the intention of attacking. Returning from same. Engaging the opponent's blade. Disengaging the opponent's blade. Beat or any other action against blade without the intention of attacking. Going from one guard position to another (invitation). Any motion of the whole body or part of it requires some effort and attention on the part of the fencer and whatever amount of attention is used for the execution of these movements, it detracts from his full concentration on the bout. The fore-mentioned examples cannot always be accepted as opportunities for attack as the opponent may offer them deliberately as a "false tempo" to invite an attack which then would be met with a well prepared Parry and Riposte. 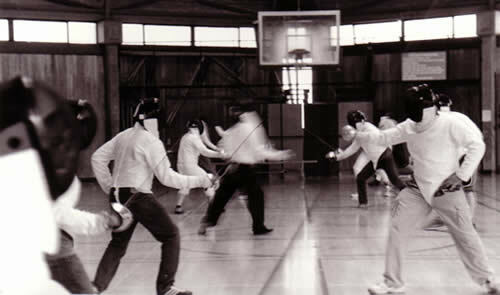 (b) Subconscious timing is that used when a fencer chooses a moment to attack suggested by his instinct.